Imagine what you could do here. At Apple, new ideas have a way of becoming extraordinary products, services, and customer experiences very quickly. Bring passion and dedication to your job and there's no telling what you could accomplish. Join our Apple Pay Security Engineering team and be creative while delivering the safest and best user-experience! If you're passionate about payment systems, digital security and software development we may have the job for you. You will have the opportunity to give to a better and more secure user experience across Apple’s products and services. 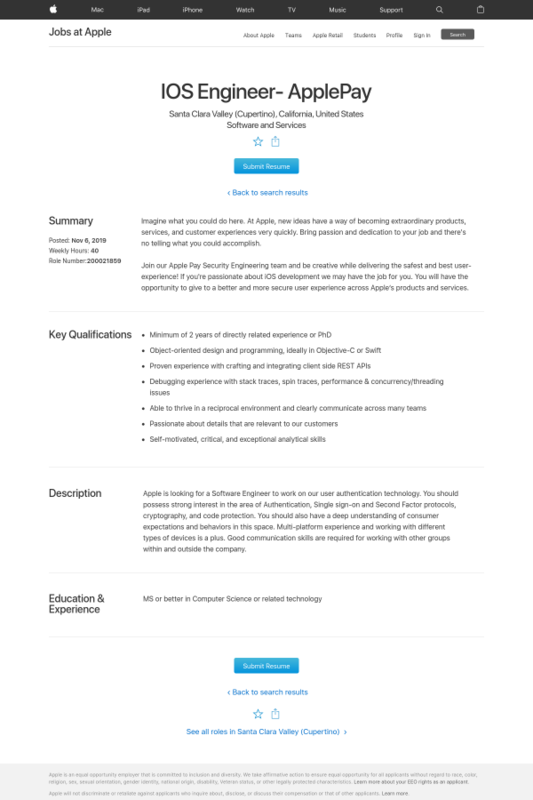 Apple is looking for a Software Engineer to work on our user authentication technology. You should possess strong interest in the area of Authentication, Single sign-on and Second Factor protocols, cryptography, and code protection. You should also have a deep understanding of consumer expectations and behaviors in this space. Multi-platform experience and working with different types of devices is a plus. Good communication skills are required for working with other groups within and outside the company.